When HTC isn't busy developing new smartphones like the Droid DNA or the HTC 8X for multiple platforms like Android and Windows Phone 8, the Chinese manufacturer is thinking about how users interact with their devices. 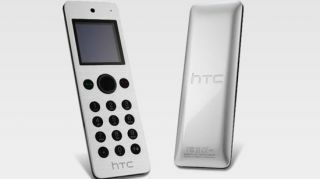 Case in point, the new HTC Mini, a new Bluetooth device that will couple with the HTC Butterfly (China's version of the Droid DNA), and allow its users to get some functionality without having to have the phone out. While the HTC Mini could be compared to similar upcoming accessories like the Pebble watch, this new candybar-style device has the benefit of being a piece of first-party hardware. The Mini pairs with the Butterfly with NFC, which then allows the Mini to act as a remote terminal via Bluetooth. What that means is the Mini effectively becomes a smaller handset, allowing you to keep the larger smartphone in your pocket or in the other room. The monochrome display can show incoming messages, a call log, and even syncs with the calendar to offer reminders. Additionally, the Mini can act as a remote when the Butterfly is hooked up to a monitor displaying media like movies or pictures. With the Mini, there's hardly a need to keep track of the Butterfly itself, so if you happen to misplace the smartphone, the Mini will activate a phone finder feature, causing the Butterfly to ring. Unfortunately, HTC is only planning to release the Mini in China at the moment, but perhaps if the Droid DNA users are vocal enough, the company can be convinced to spread the love to other markets.